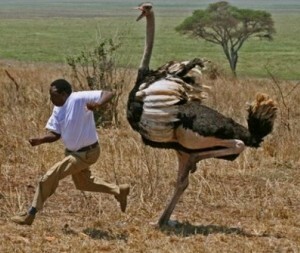 Mark makes a bold claim that he could easily beat up an ostrich. Cline finally announces that his chair is finally mostly squeak free, which is something that many listeners have been annoyed with the past few months. After this Mark declares that he could beat up an ostrich, which of course he is very wrong about. Later Cline tells us the famous tale of Mike the headless chicken and the guys discuss how The Walking Dead is not very accurate in their depiction of killing Zombies. Plus a guy who dressed as a pilot and sat down in a cockpit.